Born with a special gift, Molly could help others but existed between two worlds—undetectable by one and not fully part of the other. Usually choosing not to interfere in other folks lives, she never employed her abilities to their greatest potential. When the leader of the Animal Gang learns the truth of her skills, Molly’s simple life as a baker in her family’s shop is threatened. Could the Blue Wolf enforcer she’d been pining over help her escape and embrace her gifts . . . or is she just putting his life in danger? Edo’s entire life had been one exception after another, never the norm on any path his life leads him. Using an ability he sees as mundane, he meets the beautiful baker while on a mission for his alpha. As she is hunted by the rogue gang she entrusts her secrets and her heart to him. But can he protect her in the diesel city and still serve his alpha and pack? 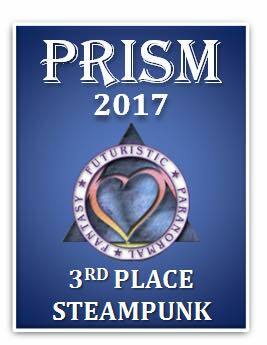 Futuristic, Fantasy, and Paranormal Chapter of Romance Writers of America Third Place winner. “The Seer’s Secret” is a fantastic read! Ms. Howard lovingly crafts a world that is gritty and full of surprises. Molly is someone any reader would love to spend time getting to know - intelligent, humorous and one hell of a baker. The attraction between Endo and Molly grows and turns into love very naturally in the developing story. The reader has a sense of anticipation for the couple’s budding romance which echoes the feelings of the couple. *sigh* You ever read a story that just hits you in all the good pulse points? One that gets you in your soul? How about one that reads from your heart? Yep, this story is all about that and more. The combo of Mikea Howard hit it out of the ballpark for me with this second story in their dieselpunk series. It got a bit more treacherous, and the hearts were strong with all the characters. Molly has knack for baking that comes through the pages of the story to make you drool, and Edo can't get enough of it, or her. The romance builds throughout the story, and we are not left hanging. Shifters and humans that we met from the first story come back and help make this story everything, and more. When Molly is in danger, everyone makes it part of their world to see that she makes it out safely, she is strong and gives everything she's got, and continues her love story with Edo. Or was it Edo's HEA? He's always had it a bit different from the other shifters, being the child of changed and not born wolves. I don't think that makes him any different, it just makes him MORE.